These silver stanchions with dark green belt are made of strong metal with a satin chrome finish. With these posts, users can direct customers and control crowds in event venues, restaurants and even retail stores. 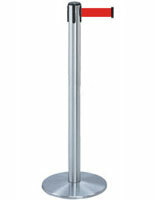 THe silver stanchions come with a round weighted base that measures 13.5" in diameter for extra stability. The stands' included strap is fully retractable and measures 7.5' long.